One major problem of online shopping is "the last mile" - the delivery to the customer at their home. In recent years, usage of the term "last mile" has expanded outside the communications industries, to include other distribution networks....The term has also been used to describe education and training providers that more tightly link individuals with job opportunities. According to Ngram the expression last mile is from the second half of the 18th century, but early usages appear to be mostly literal. when did the usage of “last mile” in relation to capital punishment start? and did it originally refer to a real distance? is the later figurative usage (communications/commerce) related to the previous one or does it have a different origin? As should be apparent from the common semantics of figurative (metaphorical) uses of the phrase 'last mile' — where the core meaning is "final period of greater difficulty, cost or suffering", which most definitely includes uses in commerce, telecommunications, transportation, and prison argot, among others — such uses are closely related. In this sense ("final period of greater difficulty, cost or suffering"), the source of the metaphor seems to have been the tradition among religious pilgrims of walking the 'last mile' of their pilgrimage barefoot or otherwise in such a manner as to show their humility and devotion by increasing their suffering and hardship as they approached the end of their pilgrimage. The composition date of the poem is not known. It is generally agreed, however, that the poem was composed in the first decade of the 1600s, and certainly it was composed before 1633, the date of its first publication. Originally and chiefly in religious contexts: a person travelling through life, esp. one who undertakes a course of spiritual development leading towards heaven, a state of blessedness, etc. ; a person who experiences life as a sojourn, exile, or period of estrangement from such a state. To make all this exceedingly plain, the religious pilgrimage symbolically represents the journey through life to death, and so on to everlasting life; the last mile of the pilgrimage symbolically represents the spiritual and physical hardships attendant upon a nearer approach to death. General metaphorical use of last mile in this sense was and continues to be commonplace. Specific applications of the sense can be found in prison argot, telecommunications, and transportation. It is no barrier to the relationship of the specific applications of the phrase in those areas with its source in the tradition of religious pilgrimage that contemporary users of the phrase are unaware of its distant origins. Looking backward now from the last milestone [in context, a direct reference to his incarceration in Sing Sing] of my life's journey, I am wondering what I might have achieved if I could have had the opportunities so many young men neglect. see the full explication given in the first section of this answer. I doubt the telecommunications usage of "last mile" has much to do with the figurative usage you cite. The original telecommunications use of the "last mile" is very concrete: It's the pair of physical wires that run between the customer's house and the telephone branch office. It's not always exactly one mile long, of course, but in a typical urban setting a mile is a good ballpark indicator of the range of lengths we're talking about. Here "last" has a primarily spatial meaning, rather than the temporal "last" in your prison sense. The last mile is the part of the communications chain that is closest to the actual customer, and therefore lies "last" when you view the world from the telco's head office. I would date the rise of this expression not to the 1970s but specifically to 1982 when the Bell System was broken up by court order and the telephony market in North America suddenly had to support competition between different commercial carriers. Competitors to AT&T would be expected to install their own equipment in branch offices and lay their own cables to transmit calls between branch offices -- but for the last mile between the branch offices and every house it would be prohibitively expensive and disruptive if each new player on the market had to dig up every street everywhere to lay cables of their own to every house they wanted to have as customers. So making rules for how multiple competing carriers would share use of the same last-mile cables suddenly became important (and, in some cases, bitterly fought over). A decade or two later those last miles became important for another reason -- namely with the spread of the Internet. Those miles-of-so of twisted copper wires were designed to carry a single voice conversation at a time, and it was and is a major engineering bottleneck to push a reasonable internet connection through them. Communications providers could upgrade their equipment at and between branch offices to newer technologies, such as optical fibers, but because each customer has his own last mile of cable it would be enormously costly to replace all of them with something better, and therefore most homes are still stuck with them. This telecommunications usage has spawned its own figurative usages, where for example in Internet video distribution, the "last mile" often means the communication path between the end user and the distributor's server farm closest to that customer -- even though the server farm is probably not located in his local telephone exchange (though in some cases it may be). And dolled me up in tack. But the last one made me sore! Nor the Springfield on your shoulder. That makes you feel your limbs are growing older. It's the last long mile! With the Tommy's and the French. These mournful words of mine! The earliest citation in Green's Dictionary of Slang for "last mile" in the prison sense is from 1932. She trod the ‘last mile’ bravely, if not with dignity. However, it appears that this can be antedated, probably significantly, as there was a play about death row inmates released in 1930 titled "The Last Mile," so presumably the slang was well established by then. A search of newspaper archives shows a large spike in 1930, probably owing to the release of this play. The first usage relative to prisons was in a February 13th, 1930 theatrical production of "The Last Mile" by John Wexley. It was mentioned the following day in a review in the New York Times. The term "last mile" was derived from the combination of the words "last" and "mile", obviously. What may not be so obvious is the meaning of "mile" (an arbitrary distance, chosen to denote a degree of difficulty). The idiom: "Before you judge a man, walk a mile in his shoes" was almost certainly is derived from a Mary T. Lathrap poem published in 1895. The original title of the poem was "Judge Softly", later titled "Walk a Mile in His Moccasins" (likely because the expression was mentioned many times throughout the poem). There are many variations on the phrase such as walk a mile in his, her or my shoes. A plea for empathy is phrased put yourself in my shoes, as well as put yourself in his or her shoes. Why do people use the term "mile" to describe difficulty? Through the process of perception as it modifies, and in turn is modified by, learning and thinking, the organism obtains information about physical space. This information generates both an image of a particular environment with which the individual has had direct experience and a set of generalized cognitive categories against which perceptual inputs from new environments can be compared and thus identified, organized, and given meaning. The physical space of a city is learned over time in three ways : (1) through behavior in which information is gained directly from the city structure through the visual, auditory, olfactory, and kinaesthetic sense modalities; (2) from symbolic representations of the city using visual media such as maps, photographs, and written words; and auditory media such as spoken words or recordings; (3) from ideas about parts of the city which have not been gained through behavior or symbolic representations, but are inferred from experiences in other spatial locations (see chaps. 4, 6, and 15). Knowledge so learned is spatially discontinuous compared with the objective physical space of the Euclidean plane. This knowledge may be organized into a hierarchy in which knowledge of higher levels is partly dependent upon, and in turn is influenced by, knowledge of the lower levels.". David Stea's position being that many people perceive distances in bits and pieces mapped together to derive an estimate without an precise measurement being considered, particularly at larger distances; and based upon their environment and experiences. This supports the position that people whom are not surveyors (or others with practice in precise distance measurement) throw around terms like "a mile" without an exact correspondence to either distance nor the environment as experienced by another person. Premise offered by @user159691: "The expression last mile appears to have been first used in a figurative sense in relation to capital punishment". "After 1896, the next few Olympic marathons varied in distance with the idea that as long as all runners ran the same course, there was no need to keep the distance exactly the same. For the 1908 London Olympics, the course was laid out from Windsor Castle to White City stadium, about 26 miles. However, to locate the finish line in front of the royal family's viewing box, an extra 385 yards was added inside the stadium. Hence the marathon tradition of yelling "God save the Queen" in the last mile. Despite the success of that first race, it took 13 more years of arguing before the International Amateur Athletic Federation (IAAF) adopted the 1908 distance as the official marathon. In fact, of the first seven modern Olympics, there were six different distances.". Other Sources: "Galloway's Marathon FAQ: Over 100 of the Most Frequently Asked Questions" by Jeff Galloway and "Practice Makes Perfect: Level 7: Preparation for State Reading Assessments" by Sondra Y. Abel. LAST MILE, THE. A naturalistic prison drama, The Last Mile opened on 13 February 1930 at the Sam H. Harris Theatre, starring a young SPENCER TRACY in the dynamic leading role of John "Killer" Mears, a tough inmate on death row who leads his fellow prisoners in a riot to protest prison conditions. JOHN WEXLEY'S play won critical acclaim and ran for 289 performances, with subsequent touring productions (including one starring Clark Gable) and film versions in 1932 and 1959. The sensation caused by The Last Mile led to a spate of prison-themed plays and films and, more importantly, to prison reform and heightening debate over the viability of the death penalty. 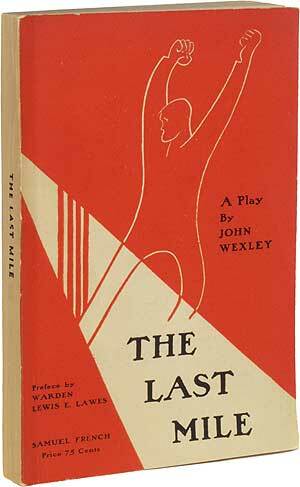 John Wexley probably came up with the idea of applying prior usage to capital punishment prior to his theatrical production The Last Mile on 13 February 1930. In death penalty parlance, the distance between death row and the death chamber is called the last mile. Neither prisons nor theaters involve a mile long walk for the condemned. I'm not aware of reports of a direct correlation between working on the last mile of cabling or delivery being a death sentence, though it's obviously possible that it has occurred. It's possibly a confusion about the often quoted statistic that "most accidents involving motor vehicles occurring within 5 blocks of one's home (only barely so, at 52%, and most are not fatal; unlike accidents occurring over 5 miles from one's home which are more likely so).". The expression "last mile" should simply be thought of as "the most difficult part", that way it's applicable to the majority of correct usages. Related usage "The Longest Yard", a movie where prison inmates play football against their guards. The implication of the film's title was that getting the last yard was the most difficult part, arguably it wasn't. Not the answer you're looking for? Browse other questions tagged etymology phrase-origin or ask your own question. Does the term “farm-to-table” as a contemporary food movement derive from early 20th century govt. programs? What does the phrase “fall foul of ” come from? Where does the phrase “Lightness Races in Orbit” come from?